Iraqi special forces have recaptured six districts of eastern Mosul, according to a military statement, expanding the army's foothold in the city. The advance comes a day after the leader of the self-proclaimed Islamic State group told his jihadist followers there could be no retreat from Mosul. An officer in the elite Counter Terrorism Service said CTS troops launched a major operation against the militants, who are now almost surrounded in their last major urban redoubt in Iraq. 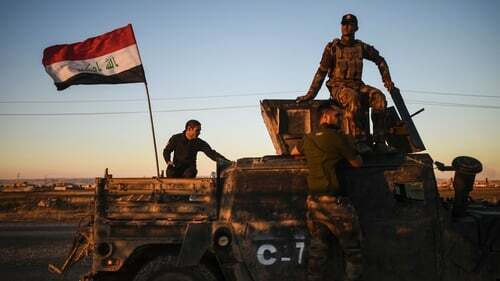 CTS special forces took over the neighbourhoods of Malayeen, Samah, Khadra, Karkukli, Quds and Karama, the statement said, inflicting heavy losses on the militant fighters and raising the Iraqi flag over buildings. One special forces officer told Reuters the CTS units may try to push all the way to the Tigris river, which runs through the centre of Mosul. Iraqi television footage from the east of the city showed grey smoke rising, and a Reuters reporter in the village of Ali Rash, 7km to the southeast, heard helicopter gunships and cannon fire. Volleys of automatic rifle fire, possibly from the militants, were also audible. A senior officer in the village said Iraqi troops had also taken two thirds of another Mosul district, Intisar, in the same eastern section of the city. IS fighters "are trying to get away", Lieutenant-General Qassem Jassim Nazzal said. In a sign of the fierce resistance which soldiers have encountered since entering the city on Monday, Mr Nazzal said they blew up six bomb-laden cars, killed two suicide bombers, and killed 30 other people. Iraqi regular troops and special forces, Shia militias, Kurdish peshmerga fighters and other groups backed by US-led air strikes launched their campaign to retake Mosul nearly three weeks ago. Winning back the city would crush the Iraqi half of a cross-border caliphate declared by IS leader Abu Bakral-Baghdadi from a Mosul mosque two years ago. The group also holds large parts of neighbouring Syria, but Mosul is by far the largest city under control of the ultra-hardline militants in either country, and the campaign to retake it is the most complex in Iraq since the 2003 US-led invasion which toppled Saddam Hussein and unleashed a decade of turmoil. In a speech released yesterday Baghdadi – whose whereabouts are unknown - said there could be no retreat in a "total war" against the forces arrayed against IS, telling fighters they must remain loyal to their commanders. Mosul is still home to nearly 1.5 million people, who risk being caught up in brutal urban warfare. The United Nations has warned of a potential humanitarian crisis and a refugee exodus, although Iraqi officials say IS is holding the civilian population as human shields. The United Nations says 22,000 people have been displaced since the start of the Mosul campaign. That figure excludes thousands from outlying villages forced to head back to Mosul by retreating IS fighters who used them as human shields.